Pueraria lobata , "Kudzu vine " (Fabaceae). Proto Remote Oceanic *Raka "kudzu vine", Pueraria lobata (Fabaceae)"
Maori: Aka (1) "root"; (2) two species of rātā starting life as climbers (Metrosideros perforata & M. albiflora, Myrtaceae), and a component in the names of many climbing plants and some with edible roots. 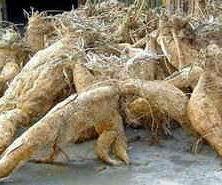 Roots of Pueraria lobata - *aka, a'a prepared for processing. Ramoaaina (Duke of York Islands, Papua New Guinea): Akar "root". It seems that in Proto Oceanic there were three synonyms for "root", which became reflected in different forms in daughter languages (although no single language inherited more than one of them): (1) *wakaR (reflected in Micronesian languages, e.g. Trukese wār, Fijian waka- and Rotuman va'a "fibrous roots", also Niuean vaka "plant roots, grow roots", (2) *wakaRi- (an affixed form of *wakaR), and (3) *akaR or *akar, reflected now in many Polynesian languages as aka. Polynesian languages reflect both the older word from Proto-Austronesian which seems to have referred explicitly to the roots of plants, and a word originating in "Remote Oceania", *Raka, but not distributed throughout the Proto-Oceanic or Proto Eastern Oceanic homelands, denoting the kudzu vine, which has swollen roots used in many places as a famine food. These became homonyms in Proto Polynesian and their meanings have to some extent overlapped in Maori and some other Polynesian languages. 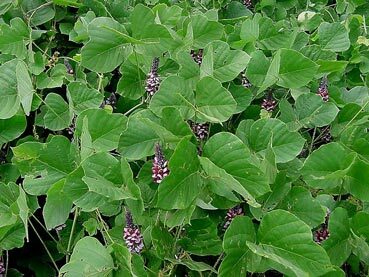 It's possible that the kudzu vine (Pueraria lobata) came in to Western Polynesia along with its name, although as a food, except in time of famine, it could not complete with taro. It is mentioned in Christophersen's Samoan Flora (p.104), but only as a widely distributed plant which "is rare in Samoa". 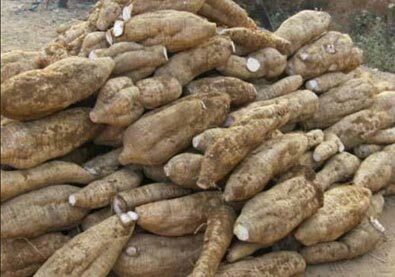 In Asia it is highly esteemed, with an important role in both medicine and as a food source in India and elsewhere. In parts of the United States, and elsewhere outside their normal range, Pueraria vines have become invasive weeds causing serious ecological problems. In Aotearoa and other parts of Eastern Polynesia the word has retained its dual heritage, although it was not accompanied by the kudzu, and refers to certain kinds of root, as well as being a generic word for vines. In Aotearoa the roots include the edible rhizomes of the raupō (Typha orientalis) and the somewhat less palatable rhizomes of the rau aruhe (Pteridium esculentum, bracken fern). 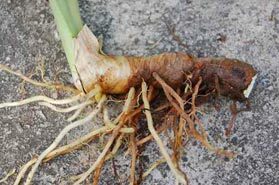 I have not been able to take or find a picture of raupō roots, but there is an illustration below of the roots of a related species, Typha latifolia, known in North America as "the supermarket in the swamps", and a favourite of wild food afficionados. There is a delightful derisive comment recorded in Ngā Mōteatea, where the poet refers to one of his rivals as "he pākura kai aka raupō, te kō ana i roto i te otaota -- a raupō-root eating pūkeko, making bird noises in the undergrowth" (see the Māori companion page for a fuller quotation from this pātere).